To see all projects use the (Previous > Next) links or the Clients page. Upper management at AlliedSignal is constantly seeking to improve all aspects of the company's performance. 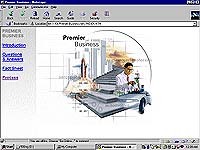 The Premier Business intranet web site defines metrics and sets goals for the entire company. In the initial phase of the project data was changing constantly. A semi-automated batch process was developed to create an quick and efficient updating process. 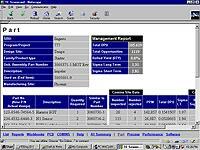 The web site content included presentations for middle managers as well as specific metrics and instructions for moving to the next level of improvement. Used to help AlliedSignal's engineers improve the quality of their products, Technical Excellence Scorecard makes the scorecards of all engineers available to each other. 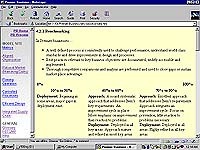 Netscape's 3.0 browser is the front-end with an Oracle database using LiveWire to produce the pages. Viewing spreadsheets is available to anyone on the company intranet. The addition of a custom helper application allows users to edit and save work as well as view data in a single application.